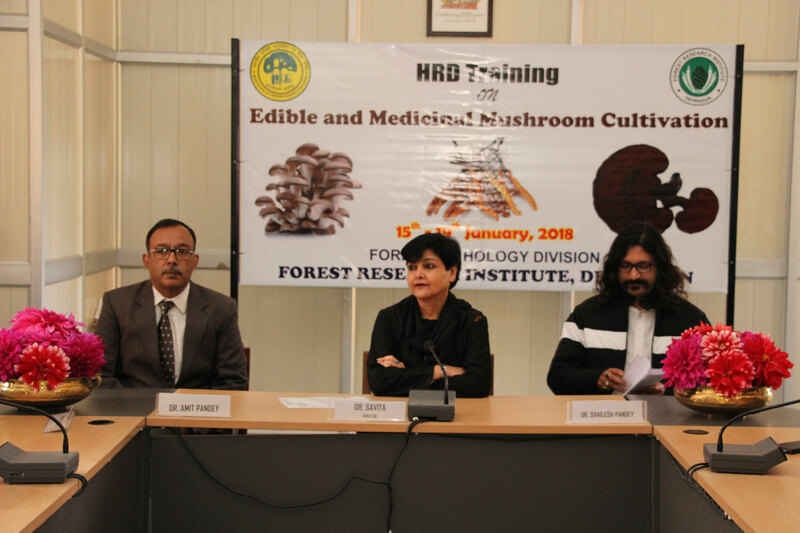 ICFRE Human Resource Development (HRD) Training on Edible and Medicinal Mushroom Cultivation is being organized by Forest Research Institute (FRI), Dehradun from 15th to 19th January 2018. The training was inaugurated on 15th January forenoon by the Chief Guest Dr. Savita, Director, FRI, Dehradun. The training programme organized by the Forest Pathology Division, FRI is a part of the novel initiative, under the ICFRE-HRD plan for capacity building of technical and scientific manpower in different institutes under the umbrella of Indian Council of Forestry Research and Education (ICFRE), Dehradun. The purpose of the training is to provide hands-on training to the Technical Officers on artificial cultivation of important edible and medicinal mushrooms. The capacity building programme will equip the participants with the practical aspects of mushroom cultivation which in future could be extended to the stakeholders, especially farmers, for enhancing their income substantially and provide an alternative source of livelihood. The malnutrition issues can also be tackled by incorporating mushroom in daily diet. The main objective of the training is to provide hands-on training to the technical officers on the cultivation of Oyster mushroom and Ganoderma lucidum. The former being highly nutritive edible mushroom is most sort after and fetches good market price, whereas, the later possesses high medicinal properties such as anticancerous, immunomodulator and improves various body functions. Apart from this, the detection of bioactive principles in mushrooms, value addition, and marketing aspects will also be discussed in detail during the training. Ms. Ranjana Juwantha, Scientist C, Forest Pathology Division welcomed all the participants and guests on the occasion. Dr. Savita, Director, FRI, in her inaugural address highlighted that the expected outcomes of this training will definitely provide clear dimensions to the extension of mushroom cultivation technology, and the participants will be able to apply their skills and knowledge among rural people and other stakeholders for this purpose. Dr. Amit Pandey, Scientist G & Head, Forest Pathology Division formally welcomed the chief guest and the audience, and emphasized the need of such lab to land initiatives for the benefit of rural community. He discussed in details the current research areas and future scope of research. Dr. Shailesh Pandey, Coordinator of the training programme, gave a detailed outline of the training module and demonstrated the steps involved in the cultivation of different mushroom species. Dr. Vipin Parkash, Scientist E, Forest Pathology Division who received a prestigious Adarsh Vidya Saraswati Rastriya Puraskar by Global Management Council Ahmedabad was also honored by the chief guest on this occasion.